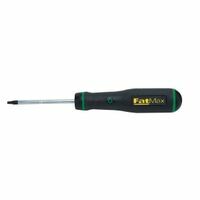 Ergonomically designed handle with slip-resistant textured grip for comfortable hold; heat-treated alloy steel bars hold up to repeated use; sets feature popular sizes to satisfy wide range of fastening needs; nickel-plated bar resists corrosion. Ergonomically designed handle with slip-resistant textured grip for comfortable hold; heat-treated alloy steel bars hold up to repeated use; sets feature popular sizes to satisfy wide range of fastening needs; nickel-plated bar resists corrosion. Chrome vanadium steel blade ensures greater hardness, strength, and durability. Satin chrome plated blade with magnetic tip. Soft cushion grip provides greater comfort and control. Thumb stop allows for added torque.